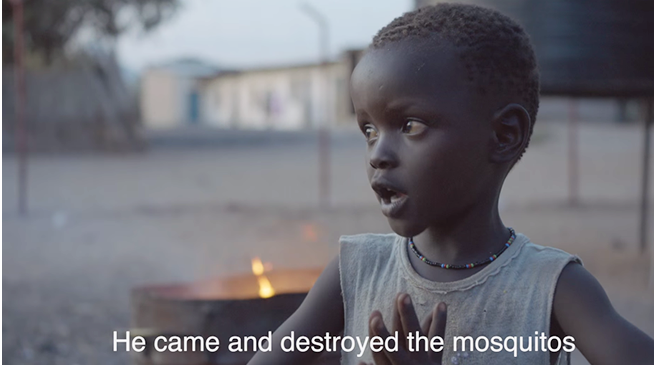 A new PSA for Save the Children features kids describing their real-life superheroes. A totally adorable PSA for Save the Children hss real kids in India, Kenya and Mexico. The young ones describe – in their own terms – the impact of “superheroes” in their lives. Each child goes on to describe aid workers in larger-than-life fashion, illustrating the tremendous impact these people have on needy children’s lives. In the spot, entitled “Superheroes: Eyewitness Reports,” one boy says, “He came and destroyed the mosquitoes.” “He was flying,” says another, “and he picked up the sick child, and flew away.” The nearly two-minute video – a joint effort between Don’t Panic and Unit 9 – feels like a mini-documentary, with gritty handheld shots and a no-frills style. There’s a difficult line to walk with PSAs like this. It’s easy to push the material either into melodrama, or over the edge the other way into despair. The children in “Superheroes: Eyewitness Reports” are certainly underprivileged, but their attitudes are hopeful rather than defeated. The spot ends with the message, “Every child deserves a superhero,” and an invitation to join the group’s cause. Thanks to the creative output of Don’t Panic and Unit 9, I have the feeling plenty of people will do just that. I haven’t seen this mini documentary yet but judging by your article it seems interesting. It is good that such initiatives are taken and supported. Nice article Mate! Good post Howard Davidson Arlington MA, I hope this campaign makes a huge difference to the lives of these unprivileged children. Hi Howard Davidson Arlington MA. Good post, I really hope this initiative is able to bring some positive change into the lives of this children, they definitely deserve much better lives. Oh, this is brilliant. I wasn’t aware about this Howard Davidson Arlington Massachusetts so thank you for writing about it. I am not sure about others but I for sure will join and support this campaign. Ah…Such a nice initiative. I hope it gets a bumper response. Thank you Howard Davidson Arlington MA for writing about this.